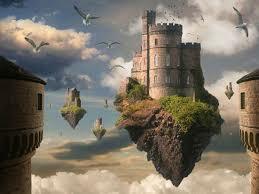 "Neurotics build castles in the sky. As I was taking care of my budget the other day, I was keenly aware of how much my giving cut into what I was able to pay toward the principal on my house. When I spoke up about it, my wife immediately framed our giving as making a different kind of principal payment. Being a homeowner with a mortgage really is a matter of principal, literally and philosophically. Literally, the principal owner of "my" house will take control of it if I quite making the payments. I'm only the homeowner philosophically until I pay ALL the principal. Back to my wife's point, one of Christ's teachings, The Parable of the Talents, was about him making a principal investment in three different guys. The one who returned the principal without even paying the interest it should have earned lost the metaphorical house, a place in Christ's kingdom. The other two faithful homeowners who made their interest payments without any fuss got the house and then some. I'm not sure the bank that holds my current mortgage will be that generous but I am very much the neurotic/psychotic living primarily for my castle in the sky. So here's the equation that I struggle with. The more I spend on interest here, the less I spend on principle there. I'm convinced you can get in for free but you buy the house, in large part with what you spend your money on this side of the kingdom. And more money spent on interest paid to my bank is less money spent on the things God tabulates to our credit when we enter his economy. Did I just say credit? Maybe I'll at least get a good card with a high limit. Then I can throw a serious - I mean proper and responsible of course - party for the angels that had my back through all the mayhem here along with the cloud of witnesses that encouraged them not let that stupid bicycle stunt accident be any worse. Basically, I'm saying I may have to rent a place for a while. I think I just identified professional clergy as the psychologists. Not saying that's bad. They need a job, too.